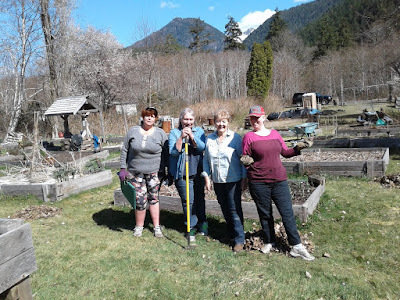 The Tahsis Community Garden had its early beginning in the fall of 2009 and in March, 2012, registered as a Society under the BC Societies Act. The member community keeps our garden maintained, healthy and thriving. All residents with a permanent Tahsis mailing address are eligible to apply for a plot at the Tahsis Community Garden. Please speak with any of the Directors for further information or to be added to the wait-list. 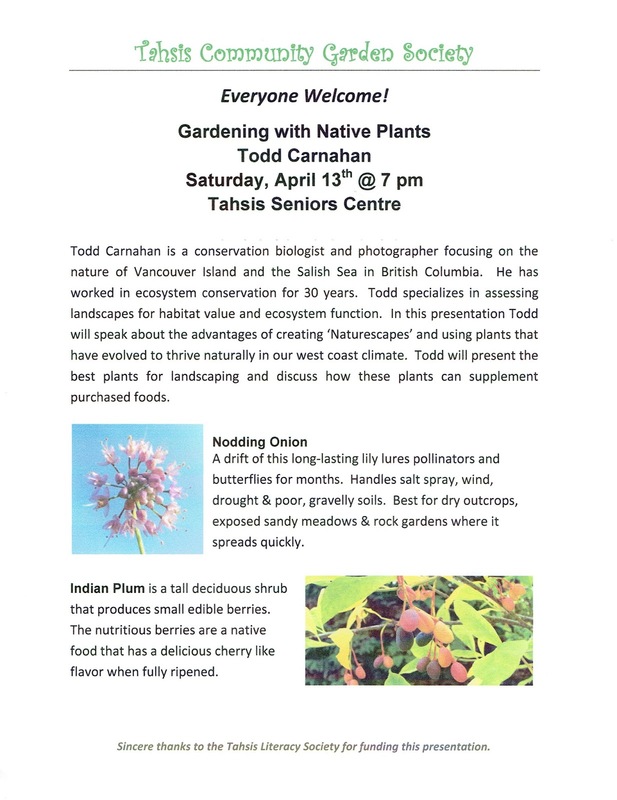 On Saturday, April 13th, the Tahsis Community Garden Society welcomed biologist Todd Carnahan to Tahsis. That afternoon, Todd did a walk-around at our community garden with eight garden members. Under the shelter of large umbrellas, we discussed invasive species (blackberries), food sources (poplar trees! ), the importance of recognising our unique and rich environment, soil erosion as it relates to salmon habitat, and wildlife interactions. At the evening presentation ‘Gardening with Native Plants’, Todd’s knowledge, humour and suggestions were very well received by all those in attendance. Todd shared many outstanding photographs including photos of the edible Camas lily, Oregan grape and the four varieties of wild crab apples – some of which may be found around our Leiner Estuary. To view Todd’s photos, visit his website Todd Carnahan Photography. It was interesting to hear how the indigenous peoples harvested, nurtured and preserved edible plants for untold generations; a matriarchal passing of knowledge. Living in an area rich in natural resources from the land and sea, natives had a very different way of cultivating food than the European practices with which we are more familiar. Participants learned that the bumble bee is superior to the honey bee in terms of pollination, and that the top three plants for pollinators are lavender, rhododendron and white clover. Heather provides good, early season blooms for bees, and beneficial flowers of asters and goldenrod make a stunning colour presentation of blue and gold. The topic of invasive plants was touched upon, with examples such as broom and the evil tansy ragwort. Todd suggested a visit to the Invasive Species Council of BC website, https://bcinvasives.ca/ as a great resource about invasive species, and best practices for dealing with them. Of special note, Todd brought with him a very old nautical chart of Kyuquot Sound. He presented it as a gift to the Tahsis Heritage Society, who were exceptionally pleased. To end his visit to Tahsis, Heritage Society directors Maureen Roth and Judy Burgess gave Todd and his companion a private tour of the museum on Sunday. When the Tahsis Museum re-opens this summer, be sure to stop in to view this chart from 1863. 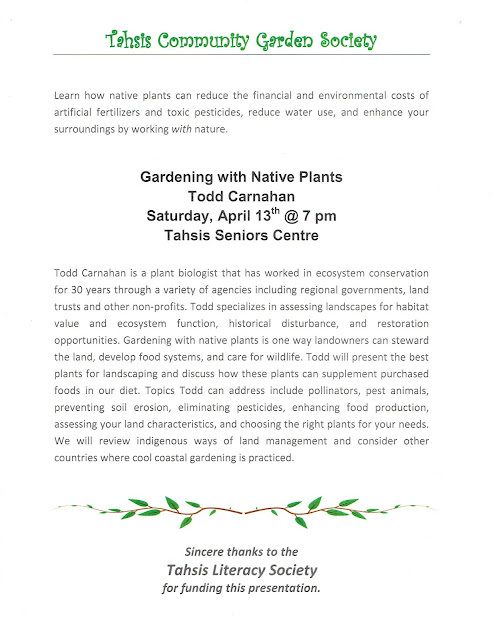 We are very grateful to Todd Carnahan for making this trip up to Tahsis, and offer sincere thanks to the Tahsis Literacy Society for funding the event, to the Tahsis Seniors Centre for making their facilities available, to the volunteers of the Tahsis Community Garden Society who organized the event, and to the villagers of Tahsis who came out on a blustery Spring night to attend the presentation. Thanks all, and happy gardening. Join us at the Seniors Centre on Saturday April 13 at 7 pm for the Native Plants presentation. Sunday is the Tahsis Community Garden Society's AGM, Seniors Centre at 1 pm, April 14th. The weather was exceptional and so were the four lovely, hardworking women who showed up first thing in the morning. 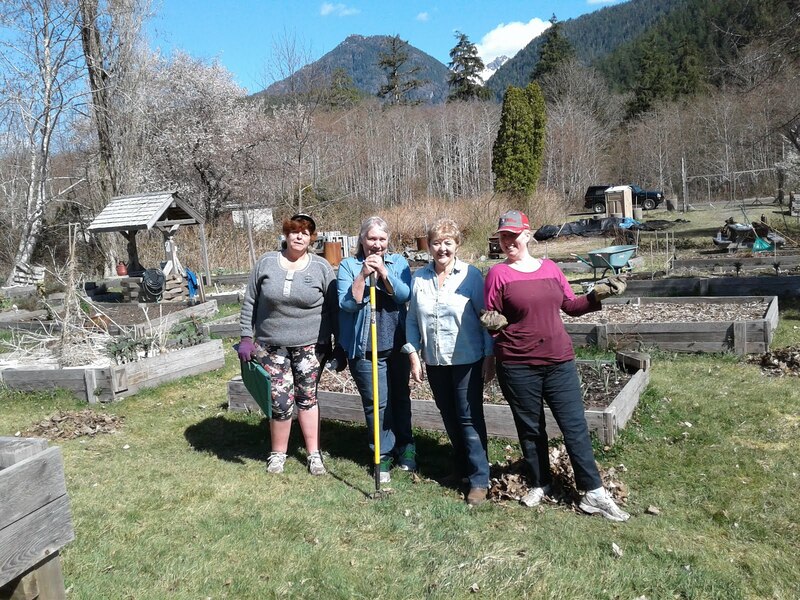 In alphabetical order, Cheryl, Juanita, Katy and Lynn, deserve a Big Thank You for all their efforts in cleaning up our community garden. Of course our heartfelt thanks is also extended to Terry, man amongst men, who always works his Garden Magic for the benefit of all. Thanks Terry!! Apologies for not having Juanita in the group photo. Was working so hard I never saw her leave for her lunch break. Cheryl is one dedicated, hard-working gal and it is to her that your Executive extend special thanks for uprooting mega wicked blackberry vines and clearing a large area for future planting. In all, there were 9 truckloads of blackberry vines/brambles & sundry debris removed from the garden and it’s lookin’ good! Thanks also goes out to Chuck for hauling two of those truckloads away previous to the work party. Cheryl and I were able to save the tabletop that was leaning precariously, looking like it was about to tip over. The legs were not rotten and Cheryl literally picked it up…whoa!...and moved it to safer ground with more support to come. Good going Cheryl! The words, “we are women hear us roar” came instantly to mind. Inspiring! Chuckle. A gentle reminder to those who share community greenhouse space and/or have yet to clean up their outside raised beds, please do so. We will soon be hosting a walk-through for our guest, Todd Carnahan and want to, with pride, put our best foot forward. In Honour of The Garden! If you have been down to the garden lately you will see that new member Cheryl O'Donnell has done a phenomenal job of clearing blackberries. Further, Cheryl has offered to put in grapes and an arbour at her own expense to enhance our space - this is simply wonderful, yay Cheryl! Garden VP Rita has already taken out 5 truckloads of brambles and what we need now is for everyone to pitch in and help with the rest. There are more brambles piled up and the garden needs to be tidied for Spring. Work party date is Saturday March 30th at 10 AM. If it's pouring rain, rain date is Saturday, April 6th. We picked Saturday as this is when the dump is open. Other chores include cleaning up the greenhouse, the herb bed needs a good prune and weeding, winter deadfall picked up, tidying, etc. 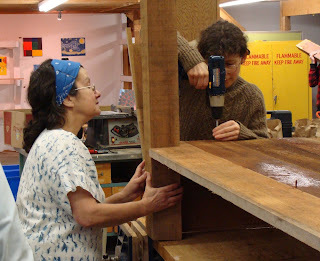 Ideally, we would like to take down sinking Tabletop bed T7 - and re-purpose the lumber. If you are not able to do any of the heavier tasks, bring your moral support and maybe some treats for the team. Everyone should bring water to drink, work gloves, tools and a bagged lunch/snack. Those who have greenhouse space should bring buckets, rubber gloves, rags/brushes, plant friendly soap. VP Rita Dawson has the lead on this work party - please contact Rita (7751) if you have any questions or specific offers of help. I am hoping you can help us spread the word to your membership about this great event - an important fundraiser for the Denman Island Conservancy - protecting rare ecosystems on the island since 1991. We welcome garden clubs from all across BC - many choose to carpool or rent a charter bus for the event. Thank you for your consideration! Early bird tickets are $18, and can be purchased online at http://www.denman-conservancy.org/home-and-garden-tour/. You can also find us (and Like us) on Facebook: www.facebook.com/DenmanIslandHomeAndGardenTour . Please help us spread the word about this great event. Share book reviews and ratings with Tahsis Community, and even join a book club on Goodreads.